The American Flag is a symbol of heritage, honor and national pride. The method of folding the American Flag is a mark of respect for all it symbolizes. The method of folding the American flag involves 13 folds, each of which has been ascribed a highly patriotic meaning. The symbolism and meaning associated with folding the American flag are detailed in this article. The Instructions and method for the Folding the American Flag are provided in an illustrated step-by-step guide. The Instructions for Folding the American Flag into a Triangle are detailed below into a few easy stages. and hold edges securely together. Fold in the triangle shape. length of the flag is folded. blue field (stars) should be visible. The flag folding ceremony represents the same principles on which America was originally founded. At the ceremony of retreat observed in the US Armed Forces, the flag is lowered, folded until a triangle fold showing the 'union' (stars). It is then kept under watch throughout the night as a tribute to the Nation's honored dead. The next morning it is brought out and, at the ceremony of reveille, hoisted aloft as a symbol of the belief in the resurrection of the body. Thirteen folds are required to properly fold the American flag. Each fold has been unofficially ascribed a meaning and is symbolic of life, the Christian religion, trust in God and eternal life. The meanings of other folds pay tribute to the US Armed Forces, the veterans, those who have died for their country and for their mothers and their fathers. Folding the american flag 13 times - the meaning of each fold. Each fold traditionally has a specific meaning which has been ascribed to each of the 13 fold. At military ceremonies when the flag is lowered or funeral ceremonies, when it is folded and handed to the widow at the burial of a veteran, meticulous attention is paid to folding the American flag 13 times. Meaning of Fold 1: A symbol of life. Meaning of Fold 2: A symbol of our belief in eternal life. Meaning of Fold 3: In remembrance and to honor of the veterans who have given their lives for the defense of America to attain peace throughout the world. Meaning of Fold 6: Is for where our hearts lie. It is with our heart that we pledge allegiance to the US flag, and to the Republic for which it stands, one Nation under God, indivisible, with Liberty and Justice for all. Meaning of Fold 8: To honor our mothers, for whom the flag flies on Mother's Day. Meaning of Fold 13: When the flag is completely folded, the stars are uppermost reminding us of the nation's motto, "In God We Trust". 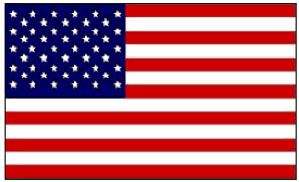 Following the folding of the American flag there is also a meaning of the Triangle. The shape of the triangle resembles the appearance of a cocked, or a tri-cornered, hat that was worn by the Revolutionary soldiers who served under General George Washington and the sailors who served under Captain John Paul Jones who fought for the United States, preserving the rights, privileges and freedoms we enjoy today.